Boasting impressive Beaux Arts architecture, well-curated stores from covetable brands and a buzz unrivalled by any other shopping district in the British capital, London’s Regent Street is the very definition of a shopping destination. Home to flagships from some of the biggest names in both British and international fashion, the Regent St. area has long been a must-visit for London-bound tourists eager to bag themselves something exceptional. In the run up to last week’s London Collections: Men Autumn/Winter 2015 event, we hit the streets to see the style that Regent Street and its shoppers had to offer. Despite its official status as a high street, Regent Street doesn’t skimp when it comes to selection. Unlike other London high streets, this area features fashion’s heavyweights nestled comfortably alongside serious luxury players. 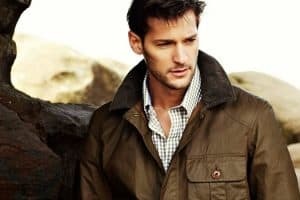 For those who like their branding bold, there’s Armani Exchange, Calvin Klein Jeans and BOSS, while those who prefer pared-back and minimal will appreciate the offering available at the likes of Banana Republic, Reiss and COS – ideal for building a timeless and versatile capsule wardrobe. The Regent Street area is also home to several smaller homespun brands, consolidating the UK’s rightful place on the global style map. Alongside Rapha sit two international brands that brilliantly blend form and function. As advisable as it is, shopping on Regent Street is high-paced and a day’s worth of retail therapy will require at least a couple of pit stops for refuelling. You needn’t trek far in search of something restorative though, since Regent Street and its designated Food Quarter (located on Heddon Street) offer up a wealth of options, from unassuming cafes to some of central London’s finest gastronomic establishments. If you’re in the market for a pick me up, Tonic Coffee Bar (15 Sherwood St.) is a petite hole in the wall cafe with extremely friendly and knowledgeable staff that serve up an ever-changing and diverse range of (delicious) coffees from several of the world’s key coffee growing regions. Regent Street is a microcosm of London’s extremely varied take on style. Often considered a hotbed for burgeoning womenswear trends, the area has followed London menswear’s trajectory over the past year, establishing itself as a go-to for (stylish) people watching. In the few hours we spent traipsing the thoroughfare, there was sharp, classic tailoring worn by gents strolling towards nearby Savile Row, an array of smart separates, a generous dose of denim (a key trend for SS15) and Dougie Poynter showing us how to pull off a contemporary rock ‘n’ roll-inspired aesthetic (very Saint Laurent). Travelling to Regent Street is extremely easy, whichever route you choose to take. Located in the heart of the capital, Regent Street is accessible via three major tube lines: Central, Piccadilly and Bakerloo. It’s also the centre point for a large network of bus routes, including: C2, 3, 6, 12, 13, 15, 23, 88, 94, 139, 159, 453. It’s clear that London’s established set of menswear destinations – from Savile Row to Lamb’s Conduit Street – has a newcomer; Regent Street offers everything from excellent food to an exceptionally wide range of fashion, as well as plenty of street style inspiration to guide you towards your next key purchase. Whether you’re a Londoner or regular visitor to the capital, let us know your recommended places to shop (mainstream and independent retailers), eat, drink and stay in the Regent Street area, and reasons why – we will then look to keep this guide continuously up to date going forward, as a reference point for all our readers. What other destinations or shopping districts would you like to see covered going forward, whether in London or throughout the UK?